CHICAGO TRIBUNE - "Playwright Shelly Garrett has been through the city many times, mostly at the 4,300 seat Arie Crown Theatre and the 3,000 seat Chicago Theatre with sold-out performances at both locations for each and every performance. I must say, it is quite amazing to see so many people bent-over and clapping their hands with laughter." DETROIT FREE PRESS - "When playwright Shelly Garrett first came to the city, his show sold-out 4 weeks, 8 performances a week, before the production even pulled into the city. No one had ever done that and still hasn't to this very day." ATLANTA JOURNAL CONSTITUTION - "The 4,678 seat Fabulous Fox Theatre had never seen anything like it, when Shelly Garrett and his first production, with the help of radio station V-103 and Bronner Brothers, sold-out 16 shows in two weeks for an average $25.00 ticket price. Do the math. He has returned successfully, as well to the Civic Center, with almost the same amount of seats." LOS ANGELES TIMES - "Theatrical Producer Shelly Garrett has created a burst of activity in this city and the black theatre scene in Los Angeles has been buzzing ever since. Every black playwright and director we spoke with credits Shelly Garrett for this successful activity." NEW YORK POST - "Shelly Garrett, producer, writer and director is happy his theatrical comedy stage plays are sold-out hits across the country and now he has virtually taken-over our city." WASHINGTON POST - "All we can say is Shelly Garrett productions are unlike any others, and that's a really good thing, especially for him. Let the money flow." PHILADELPHIA INQUIRER - "Shelly Garrett has changed the way this city attends plays. In other words, the urban audiences never did, until his productions began coming to town. Without a doubt, Philadelphia loves Shelly Garrett and his theatrical stage plays." PITTSBURGH TRIBUNE - "Shelly Garrett's stage plays are full of laughter. They are just plain fun." 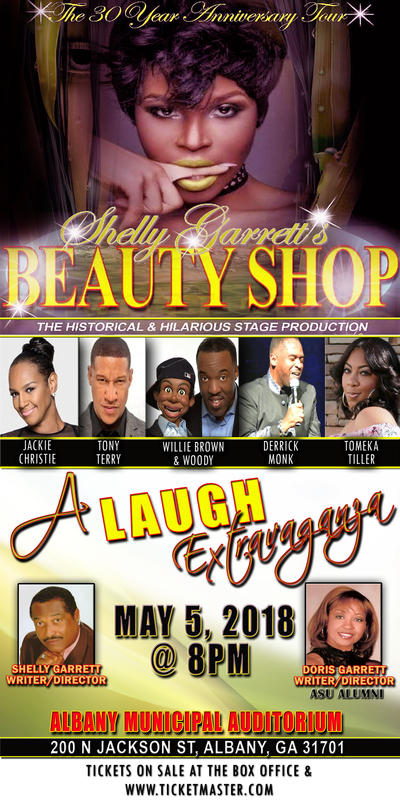 ST. LOUIS DISPATCH - "Shelly Garrett has an eye and certainly an ear for hilarious urban comedy. In his past shows, the jokes and comedic timing are as gusty and sharp as the winds at The Fox Theatre here. All in all, a Shelly Garrett stage production is a must see, of the order of "The Colored Museum" from years ago. THE ATHENS BANNER-HERALD - "Shelly Garrett strikes comedic gold. For more than 20 years, he has had sold-out shows and wooed audiences across the country." SUITE 101 (RHONDA CAMPBELL) - "Shelly Garrett's live stage plays have been entertaining and inspiring sell-out audiences across the United States since 1989." WALB-TV (NBC AFFILIATE) ALBANY, GA - "Shelly Garrett's stage production was so successful in New York city, it out-sold the very popular Broadway musical "CATS," as the top theatrical production in the city." NATIONAL THEATRE CRITIC, ALICE T. CARTER - "Since 1986 and long before Tyler Perry and his 'Madea' plays, Garrett's company has toured the United States with a succession of dynamic stage production and musicals." TRI-COUNTY BULLETIN - "Stage plays, which are produced, written and directed by Shelly Garrett seem to sell-out major theatres across the country. His last production was sold-out 10 days before it opened here in Oakland's 3,000 seat Paramount Theatre. When you hear the name Shelly Garrett, you might not want to wait until the last-minute for tickets."